Bobbers loaded...3 tips for more Spring panfish! Perhaps one of the most utilized and familiar tactics used by today’s modern angler is that of the bobber and minnow combination—especially in the Spring pan fish arena. As simple as it sounds, there are three key factors that will help you put more fish in the bucket when using bobbers as your primary presentation. Split shot placement, hook placement on the minnow, and the minnow itself is where it’s at! Split shot placement (or its distance from the minnow) is extremely important—and must be mastered. The good news is that is also applies to any bobber situation—hard or soft water, crappies or walleyes! Ever been in a Turkish prison? Ever been in a boat (or on shore) where one angler is out fishing the others 3 to 1? If your answer is ”no”, then you’re lying--lol. It’s the classic scenario—everybody has the same bait, the same color lure, the same line variety, the same depth, the same…..you get the drift. But did anyone in the group take note of how far the distance between the minnow and the split shot is on the “hot rod”? Probably not. The fact is, that little detail can be a deal breaker in the numbers of fish you will catch. It is important to match the activity of the minnow to the mood or feeding attitude of the fish. How any times have you witnessed on the Vexilar, AquaVu, or visibly, a fish cruising up to the bait, waiting for a second, then sinking slowly away—all while the bobber and minnow is cranking out the Indy 500 going in circles. Odds are the minnow had a leash that was to long-- so it was able to swim away from an inactive fish as it approached your minnow and “kinda tried” to eat. Time to adjust the split shot placement and shorten the “leash”—to restrict the minnow from dodging death. Last I checked, it is much easier to catch a dog tied to a tree on a short leash verses a long leash correct? Especially if you’re not in the mood the play keep away, LOL. I start with an average of 7 inches of “leash” in between my minnow and split shot and adjust the distance from there. Now if the fish are fairly active, a 7”-10” leash will typically work fine. But of course that only happens 10% of the time, so typically I start at 7” then move the split shot ½” at a time closer the hook until bites are produced. On average, a 4”-7” leash will catch the inactive or lazy fish. The shorter the leash—the smaller circle the minnow can swim to potentially escape from being eaten. Here’s some basic math—a 4” leash equals an 8” circle the minnow can swim—a 7” leash equals a 14” circle the minnow can potentially swim. So with that in mind, putting your split shot 12” from the bait might not be that good of an idea in general. When the fishing first begins, make sure everyone varies their “leash” length and bait depth a little but make sure that everyone has the same size/weight of split shot on their line so that it is easier to work as a team and figure out what the best distance actually is. The reason for equal weights is that all of the minnow are “anchored” the same. The first question you should ask the angler who caught the first two or three fish is: “How far is your split shot from your hook?” The second question should be: “How high off the bottom is the bait?” The third question I like to ask is: “Where or how are you hooking your minnow?” Huh? Yup, that’s what I said. Is the minnow hooked in the lips? In front of the dorsal fin or behind the dorsal fin? As a basic rule, avoid hooking the minnow through the lips while fishing with a bobber. Even though there have been times (rare) when a lip hooked minnow under a bobber has worked, it’s my personal professional opinion that hooking the minnow in front of the dorsal fin is better than the “traditional” behind the dorsal fin. The reason is that it is much easier for the minnow to actively swim around on “the leash”. I compare it to tying a rope around your waist (in front of the dorsal fin) verses around your ankles (behind the dorsal fin or close to the tail)and trying to run 100 yards. It’s obviously easier to run with the rope around your waist. This of course keeps the minnow happy and healthy much longer—which helps keep your dialed in presentation more tempting. On that note, picking the right minnow is not to be taken for granted. I tend to choose the minnow that is medium sized (for the species that is being used). I avoid the monsters or the tiny minnows—the same goes for leeches. Oops, wrong article. I also aim for the minnows that are jumping out of the minnow scoop or jumping out of my hand multiple times. If the minnow is hard to catch or grip because it’s out of control—that’s the minnow I want. Give the lazy minnow to your buddy and start placing your bets, LOL. Let’s face it, not all minnows are created equal. Time on the hook will separate the good minnows from the bad minnows quickly. Pay attention to the activity of the minnow via bobber movement, line twitching, etc. If you notice your bobber not moving around much, ditch the dead beat minnow and replace it with a new minnow pronto! Also, if you have to “wake up the minnow” by twitching the line—ditch the old minnow and get a new one. There is no time for wimpy minnows. One of the downfalls and success killers while bobber fishing of any kind is not keeping fresh lively minnows on the hook—that’s a free tip by the way. Its plain nd simple. Its fun to catch perhaps the most under-rated fish in Minnesota. Years ago, the feisty northern pike inherited a bad wrap. I still meet people that refuse to touch them, catch them, clean them, or will even cut the line and not allow them in the fish house (or boat). I dont see the problem. They are agressive, fight well, and taste great. I actually prefer the texture over a walleye fillet. And I have yet to meet a client while eating a walleye shore lunch (with a pike in the mix) identify the taste difference between fresh caught walleye ans a freshly caught northern pike. With the lack of snow cover throughtout many portions of the state, many of the under water weed beds remained green and full of life throughout the winter--thus keeping pike around. While some of the biggest pike in the system are chasing suspended forage, there is still an easy to find popoulation of active pike in water depths between 6-12 ft deep. I like to find weed beds using electronics, an under water camera, or actualy looking down the hole. Large shoreline flats that extend about 1/4-1/2 mile from shore into the main lake diced with weeds with a steep drop off nearby that leads to deep water (25 ft plus) will hold fish-especially if there are panfish around for them to eat. Fun to catch pike love small bluegills, crappies, and perch as a food source. 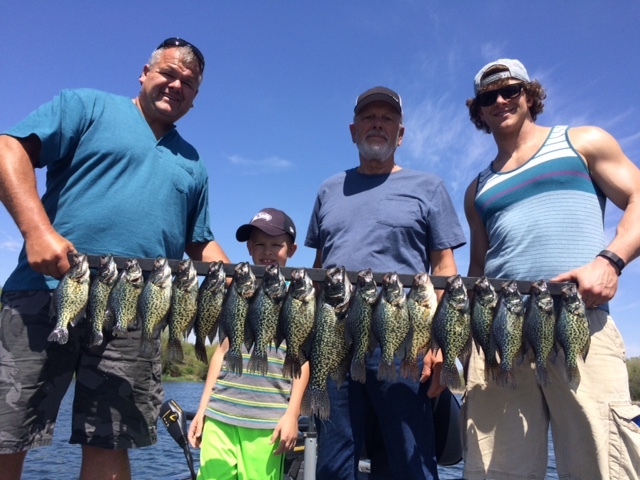 So if you have a few spots that you have caught small panfish --start there. Whatever the depth of the weeds are, place the bait about 18"-2ft. off of the bottom next to the weed beds. If the weeds are expansive, just make sure the minnow is above the tops of the weeds-otherwise the minnow will hide in the weed beds. Rig up a number 2 chartreuse hook with a lake shiner or a golden shiner hook lightly infront of the dorsal fine. Believe it or not, shiners will work much better than sucker minnows. A 3-4 inch long minnow is perfect and will up you hooking percentage. If your hawg hunting with deoy sized minnows, I recommend a quick strike rig with red hooks.